Our Classroom Escapes allow schools to choose from a selection of workshops based on specific National curriculum Subjects such as Maths, History and Science. Whilst we follow the chosen theme we take every opportunity to explore Cross curricular links wherever possible. How We Organise A Day of Primary School Classroom Escapes. We have designed our Classroom Escape Days in Primary schools so that all year groups in KS2 can take part. A typical escape session is designed to last between 1 – 1.5 hours. This allows for KS2 classes in a one form entry school to individually take part using a timetable similar to the one on the right. (2)We can offer two instructors on the same day but you will need two spaces to run the activities. This costs £900.00 plus VAT as we normally need to bring two vans. 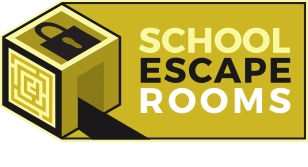 To allow our Classroom Escapes to run at their best we prefer to run them in halls or large spaces. We are well versed at moving our equipment so that it does not interfer with the lunch time routine. If you dont have a hall, or it is not available it is possible to run sessions for a single class in a classroom. However we would need to run all of the days sessions in the same room as we have a lot of equipment.